Even though I might not be a major gamer I am a major geek when it comes to getting hot deals. So it shouldn't be a surprise that I'm always excited when Steam's annual sales come around, and this year is no different! 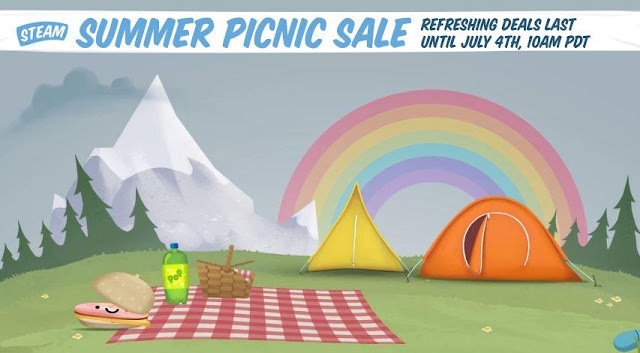 As one of Valve's major events held each year, the 2016 Summer Picnic Sale features tons of discounts on a vast variety of games featured in the Steam store. This time around, Steam is doing things a little different, and doing away with some of the daily deals and other features we saw in previous sales. This means unlike their other major sales events you won't have to constantly check in to the Steam site to see what discounts are being featured on Steam's front page. Previous Steam sales typically assigned games one of two prices at any given point: a normal discounted price and an even-more-discounted price that only took effect when Valve was featuring the discount on its front page. If you truly wanted to save, you had to be glued to Steam's site. Now, any discounts Valve features on its main Steam page are just that—highlighted deals, but deals that will remain the same whether they're currently being featured on the page or not. Of course this takes a little of the fun and adventure out of it but it definitely makes it a bit more helpful and ensures everyone has access to the same deals at any time. As a special offer in the Summer Picnic Sale, select games are available in themed complete-the-set bundles! This is by far going to be one of the best deals you can get during the sale since it will allow you to buy the entire set of games for additional savings. Don't worry if you already own one of the games, Steam has said they will automatically be removed from the price! The different bundles include a variety of great games like Slime Rancher, The Witness, Scrap Mechanic, DuckGame, Gremlins Inc, and more! For those looking for an even better deal you can score additional savings at Best Buy this week. They are offering 20 percent off a second card when you buy any gaming currency card. So should you buy two cards of the same amount, that works out to a total discount of 10 percent. That's not a huge amount--$10 if you were to buy two $50 cards--but it's still essentially free money. The Steam ale and all these offers will be available now through July 4th at 10am Pacific. Have you found any hot deals or great game discounts woth mentioning? Feel free to share what you find below so we can consider purchasing them.